Our Rose Harissa is a hot chilli paste with fragrant spices and rose petals. The subtle sweetness of rose petals balances with the heat and smokiness of chillies to create a delicious depth of flavour. Traditionally used across Libya, Tunisia, Algeria and Morocco to add heat and flavour to stews, soups and tagines, this authentic blend of herbs and spices makes a delicious addition to a wide range of dishes. 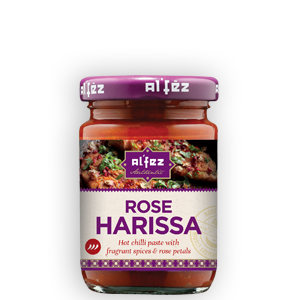 A versatile paste, Rose Harissa can be used as a spread for wraps and sandwiches, added to mayonnaise or yogurt for a tasty dip, for coating and marinating meats or mixed into couscous and rice for an extra kick.